Every year while the church heralds Advent, the world greets Santa. For years I’ve loved this valiant attempt to hold on to allow the child to gestate, while the world casually tosses the baby into the muck and the mire of busy streets, crowded malls and boisterous, drunken, celebrations. I still treasure the memories of my first Advent seasons. I came to the church when I was just fifteen years old. I had never even heard of Advent. I was excited about my first Christmas in the church. I wanted to soak it all up. I expected Christmas carols, and stories about the Christ Child. I had no idea about the darkness of the wilderness. My first inkling came on the Saturday before the first Sunday of Advent. The Lutheran church where I was introduced to life in and among Christians, was comprised mainly of Scandinavians who had more Advent traditions than you can shake a Yule log at. Don’t get me started on the lutefisk!!! No, gelatinas lye fish for me if you please, just save the rullupylsa for me, and maybe just maybe I’ll have a little pickled herring, but pass the aquavit and let a few icy shots loosen us up and before you know it … off da… we’ll all be warm from the inside out. T’was the day before and all good little Lutherans, their Advent wreaths do prepare. Four candles of Hope, Joy, Love, and Peace to light our way through the dark and dreary cries of John the Baptist who for the few weeks of Advent damns us all as we brood of vipers, burn as the wild man shouts “Repent, Repent” from that very first wreath making party I was hooked. Content to wait and watch, while the world dashed and rushed its way toward Santa’s grotto, I hung out in the blue world of the church, holding on to the centuries old traditions of the church’s Advent celebrations. One of the hardest things about leaving home to come to Ontario to begin Seminary, was missing out on the Advent celebrations with the friends whose love and nurture got me into the church in the first place. Every year for about twenty years, we gathered together each and every Advent Sunday for church followed by a slap-up meal at which we lit our homemade Advent wreaths. Advent was the season of Hope, Joy, Love, and Peace, for me and I loved it then, and I love it now. Well, if I’m honest I do love Advent still. It’s just, well it’s just those Advent hymns…I’ve long since gotten over the exclusive language as we wait for the King who Shall Come (only Christians could say that with straight faces?) I must admit that the near absence of the women, who after all are the stars of the show and hardly get a mention, poor old Elizabeth even the mute Zachariah outshines her, and Mary well poor little Mary, the Angel Gabriel from Heaven Came with his heavenly hosts to drown out the Magnificat with his Gloria’s oh highly favoured lady. Tinkering with inclusive language helps a little, but at the heart of all those hymns are the Advent texts. Each and every first lesson, carefully selected to use the Hebrew Scriptures as if they were literally written accounts of prophets predicting the birth of Christ. Every preacher worth their salt, struggles to make these ancient texts relevant knowing full well, because they learned in seminary that prophets can no more predict the future than preachers can stop the masses from shopping till they drop. and the suspicion inspired by our failure to embrace the fullness of life’s wondrous mysteries in favour of that screaming wild man John the Baptist who isn’t fit to tie the sandals of any self-respecting Messiah’s feet, but thanks to Handel’s Messiah, he gets a front row seat at our Advent liturgies, spouting a baptism of repentance against which Jesus insisted upon a baptism filled with grace. Prepare the way of the Lord as if our God, the creator of all that is, was, and ever shall be, is frozen in time…back there somewhere, leveling valleys and making the crooked straight, while the innocent continue to suffer and the weak wash up on our beaches. I do love Advent. Our instincts at this time of the year, to linger in the darkness a while make sense in the face of all the turmoil that the world endures; our waiting and our longing, for Emmanuel; for God to be with us are absolutely correct. But our nostalgia for what never really was, may be keeping us from the memory of our future. Traditions are beautiful. Traditions can ensure that we endure. But if traditions become all about preserving what once was, we run the risk of enduring our traditions in the vain hope that by repeating the past, we can somehow change the future.Surely, the ONE for whom all this waiting and longing is about, is not about preserving the past but rather about embracing a future in which everything changes. If our texts hold us in a world that never was, with it’s three-tiered universe, and humans we barely recognize as human, how will we summon up the courage to meet and engage the cosmos? If the God of whom we sing, requires a saviour to be sacrificed in order to save us all from satan’s power, oh wait, no carols yet… if this God of whom we sing is too small to be the ground of being in a cosmos so vast our brains can’t even begin to contemplate it’s limits, then who can this Jesus be for us, but nothing more than a cartoon Santa Claus, who comes bearing gifts we no longer need or want? That there is darkness all around us we have no doubt. But the mysteries of our deepest selves point us toward the mysteries of the immense cosmos of which we are made and from this wilderness our longings are expressed in questions our ancestors couldn’t begin to imagine. It’s enough to drive this humble preacher mad. The religious right has highjacked the phrase born again and to hear some Christians tell it, being born again requires that we become something other than ourselves. We’ve all heard and read too many sermons that call us to deny our human nature, turn from our sinful nature and be born again. I have grown to hate the term born again. But this idea of new birth lies at the heart of Jesus’ teachings and points not to denial of who and what we are, not a turning away from our humanity, but rather allowing that which lies deep inside of us to come forth again. 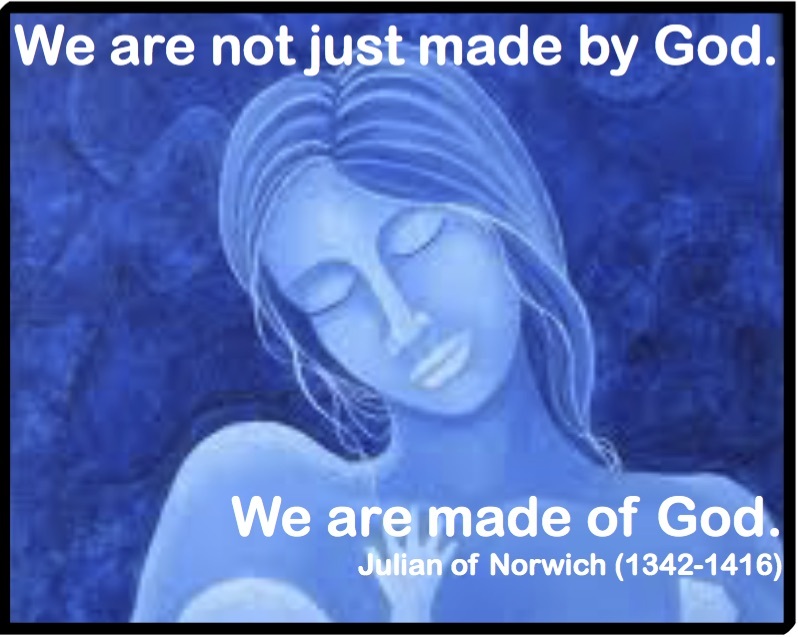 Julian of Norwich reminds us that we are not just made by God, we are also made of God. All of creation sprang forth from God and is of God. Being born anew is setting free that which lies deep within, what is at the heart of all things—made of God—being set free to emerge in radically new ways. As Newell puts it, “The Rebirthing of God is precisely this. Within us is the likeness of the One from whom we have come and of whom we are made. We are made of the Love that lies at the very heart of reality. We are made of the light that was in the beginning. We are made of the Wisdom that fashioned the universe in all of its glorious interrelatedness. We are made of the LOVE that longs for oneness, for justice, and for peace. Imagine if you will, a church born anew, a church that seeks to be a midwife to the rebirthing of the sacred; a church that seeks to facilitate the rebirthing of relationship among all that is of God, a church that not only celebrates creation but presides at the birth of emerging new relationships between the creatures of the earth and the forests of the earth. Advent blue is a dark blue not a light sky blue. From within the depth of that darkness new birth awaits. Let our Advent traditions give way where they must so that we can prepare the way for the re-birth of God, in, with, through, and beyond us. For those of us who love the traditions of Advent, this birthing may be filled with pain, but surely not more pain than we can bare for the sake of those whose pain surpasses ours, in ways they are longing for us to understand. I am reminded that the word humility comes from the word humus, which means earth. The church is being called to humility, to remember it’s earthiness. To call all of us to a kind of sacred midwifery, to facilitate the new birth of that which lies within the earth and deep within the heart of humanity. The humility to which we are called is to serve the earth and her creatures for we are one. Yes, there wild men in the wilderness, prophets of old calling us to wake up, for even the wild ones have wisdom to teach us, the way forward must be mindful of our traditions, but not bound by them. We must wake up, prepare ourselves to make a pathway in the wilderness. If Christianity is to be born anew, we must be about the work of rebirthing God, the One in whom we live and breathe and have our being. Institutions are not alone in their love of traditions, each of us treasure traditions that hold us into patterns of behavior that may not be as life-giving as our memories would have us believe. Particularly at this time of the year, we find ourselves doing things simply because that’s how we’ve always done them. This Advent season, let us ask ourselves what we need to let go of so that something new can be born? What do we need to let go of so that LOVE can be born in, with, through, and beyond us? This entry was posted in Adult Education, Bible Study, Evolutionary Christianity, Progressive Theology, SERMONS, Theology and tagged emergent theology, Evolutionary Christian sermon Advent 1C, evolutionary christianity, great turd falling, John Philip Newell, Julian of Norwich, Lutheran sermon Advent 1C, Progressive Christian sermon Advent 1C, Progressive Christian sermon John 3:1-9, progressive christian spirituality, progressive christianity by Rev. Dawn Hutchings. Bookmark the permalink.